Posted on January 12, 2013 by Clare Cooks! Brussels sprouts and capers! I can’t think of anything finer. 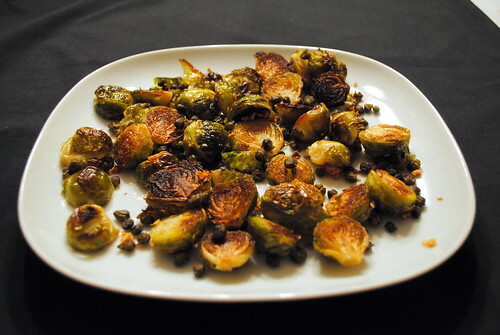 I love both brussels sprouts and capers. This dish is the stuff my dreams are made of. Roasting the sprouts is essential. Roasting gives them a nuttiness and subtle caramelized flavor that is amazing when combined with the salty, crispy capers. The red pepper flakes are a nice background note. You can adjust your red pepper usage to your own taste. I like spice, so I went a little heavy with it. With so many other wonderful flavors it remained a nice accompaniment to the dish, not overpowering and hot. Heat oven to 425F/220C. Toss brussels sprouts with 2 Tablespoons of olive oil. Place sprouts on rimmed baking sheet. Roast 15-20 minutes until crispy and golden. While the sprouts are roasting, blot capers on a paper towel. Heat remaining oil in a large frying pan over high heat. Add capers and cook, stirring carefully (mixture will splatter), until capers start to open and are brown and crisp, about 5 minutes. Add garlic and chile flakes to pan and cook until fragrant, about 1 minute. With a slotted spoon, transfer capers and garlic to a paper towel to drain. 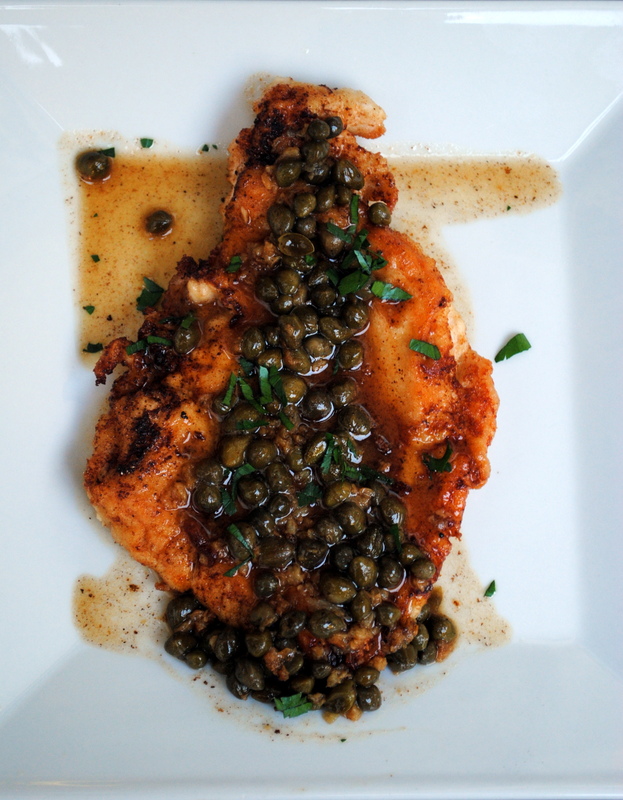 Transfer to a serving plate and sprinkle with capers and a squeeze of lemon. Posted on December 8, 2012 by Clare Cooks! You could whip this up in less than five minutes. 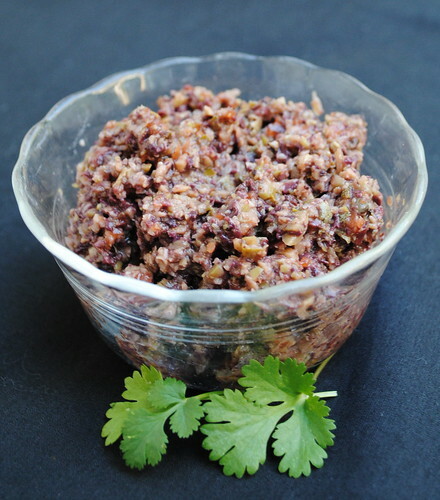 Tapenade is a great appetizer. It is wonderful for dipping veggies and is also great on crackers or bread. I actually made this tapenade not as an appetizer (even thought that’s what we used the leftovers for), but to put on chicken that I baked in the oven. It was also delicious. It is a pretty versatile spread. don’t like a lot of olive oil or overly oily dipping sauces, so I went a little light on the oil. You can add as much or as little you feel necessary. Put all the ingredients except the lemon juice and olive oil in a food processor. Pulse for about 5 short bursts. Add in lemon juice and a small amount of olive oil. Pulse several more times. Add more oil if you need to. Continue pulsing and adding oil or lemon juice until desired consistency is reached. Posted on November 11, 2012 by Clare Cooks! This has quickly become one of my go to recipes. I’ve made it several times now and I like it more and more every time. 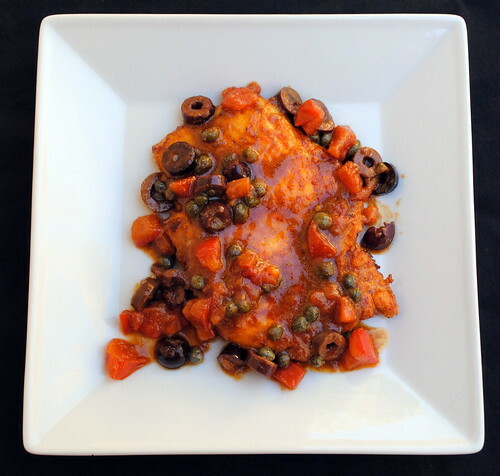 Then again, you could add tomatoes, olives and capers to pretty much anything and I would find it delicious, so I might be a bit biased. It’s perfect for a quick and easy dinner (like 15 minutes and it’s ready, easy). I’ve made it both with canned diced tomatoes and fresh tomatoes and I hate to say it, but I might have liked the canned tomatoes more… The fresh tomatoes did not break down as well and the skins were kind of tough. I also found that I had to add a little more liquid to get a sauce going with the fresh tomatoes. I am a very saucy person, so when a dish has a sauce, I like a lot of it. If you happen to have super ripe and juicy fresh tomatoes, I wouldn’t worry about it, but if your tomatoes are kind of under ripe and sad, canned would probably be your best bet. 1 large ripe tomato, chopped or 1/2-15 ounce can diced tomatoes, drained. Place the chicken breast on to a flat surface and cover with plastic wrap. Bash with a rolling pin or mallet to flatten, then lightly coat in the seasoned flour. Heat the oil and butter in a pan, add the chicken and cook for 3-4 mins on each side until crisp, browned and cooked through. Remove from the pan and keep warm. Add the tomato, capers, olives and wine to the pan, season to taste, then bring to the boil. Bubble the sauce for 2-3 mins until the tomatoes are starting to break down, then spoon over the chicken. Posted on April 25, 2012 by Clare Cooks! 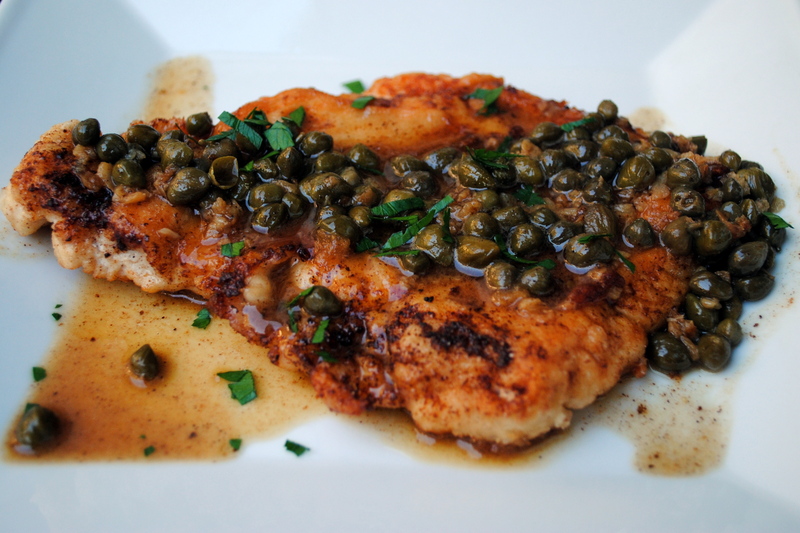 Chicken piccata is one of my favorite dishes. The only thing I don’t like about it, is how long it can take to make. There are a lot of dishes and pans and dredging and other stuff involved. Definitely not a fast meal. 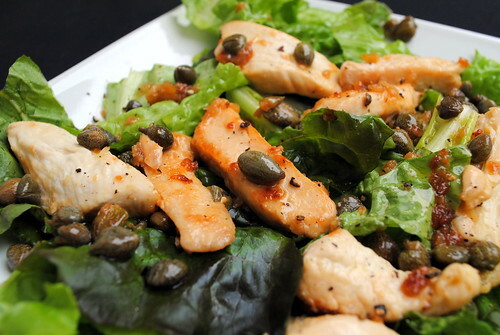 This is kind of like a chicken piccata salad. You really can’t go wrong with this recipe. 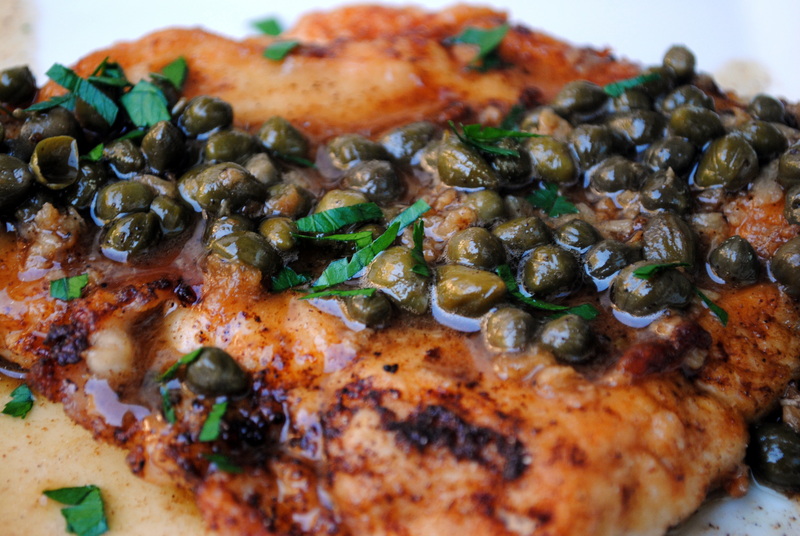 It’s got all the delicious parts of a traditional chicken piccata; capers, garlic, lemon, yum. It will be ready in 15 minutes, which makes it a winner in my book. This is an easy and tasty weeknight, or any time, meal. Heat the oil in a frying pan until sizzling. Add the chicken and cook for 3-5 minutes on each side or until golden and cooked through. Add in garlic when chicken is almost cooked and cook until golden. Throw in the capers and lemon juice and stir until warmed through. Serve on salad leaves. Lightly drizzle white wine vinegar over salad and add freshly ground pepper to taste. I love brussels sprouts. Love them. They are a very misunderstood vegetable. Most people have some sort of traumatic childhood experience of being forced to eat brussels sprouts in order to not offend some distant great aunt or something. When brussels sprouts are prepared well, they are simply delicious. This recipe is so simple and so fast and has such amazing ingredients, it’s hard to go wrong. 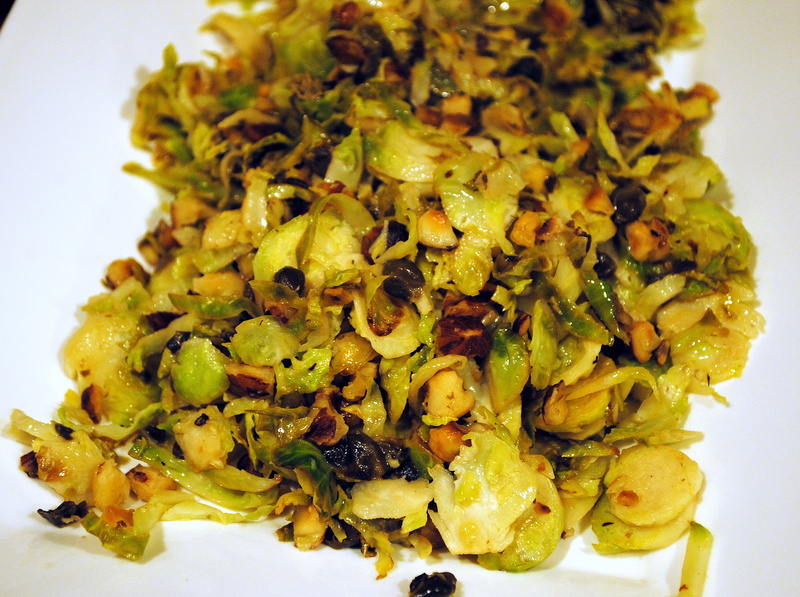 I mean, capers, hazelnuts, and brussels sprouts together, what’s not to love? If you have a food processor, definitely use it to shred the sprouts, there is no need to fool around with a knife or a mandoline if you don’t have to. If you don’t have a food processor, slice carefully, no one wants to lose a finger on Thanksgiving. Remove any loose or yellow leaves from the Brussels sprouts, and slice each sprout in half from top to bottom. Then chop them roughly into shreds, or hash them in a food processor. Heat a cast iron skillet over medium-high heat and add the chopped hazelnuts. Cook for 3 to 4 minutes, shaking the pan frequently. When the nuts are turning golden brown and smelling toasty, remove them from the pan and toss with the hashed Brussels sprouts. Add the olive oil to the pan and set it over medium-high heat. 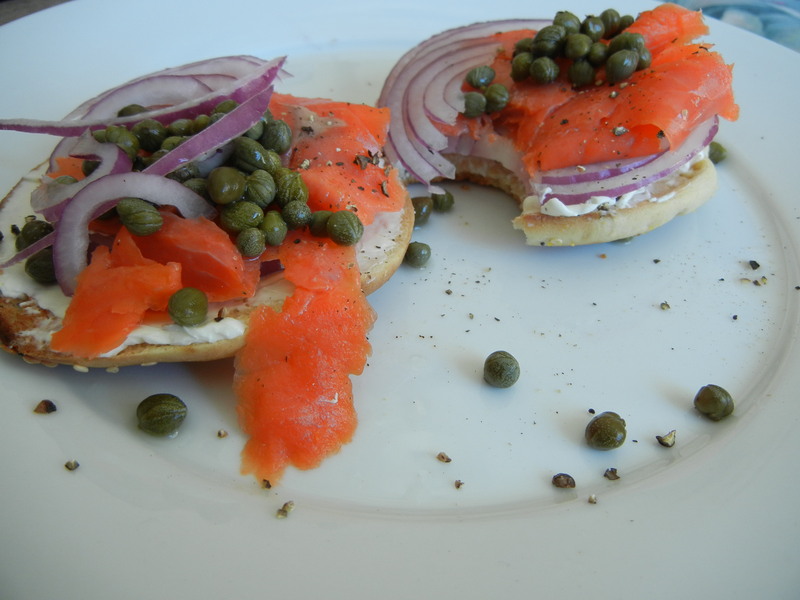 When the oil is shimmering, add the capers. (Stand back and be careful; the oil will spit and splutter up!) 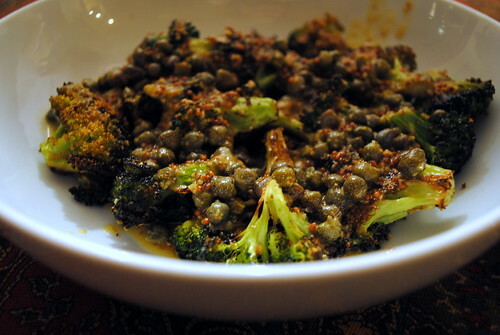 Fry the capers for about 60 seconds, or until they start opening like little flowerbuds. Add the Brussels sprouts and hazelnuts back in to the pan. Stir thoroughly to coat the sprouts with the oil and to mix in the capers. Pour in the lemon juice and cook, stirring frequently, for about 5 minutes or until the sprouts are tender but still snappy. Remove from the heat and add salt and pepper to taste. Serve immediately. Posted on November 8, 2011 by Clare Cooks! This was one of my favorite dishes growing up. 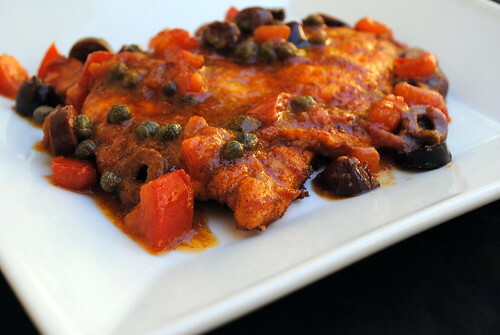 Every year on my birthday, I got to pick the meal for dinner and, vegetarian years excepted, the meal always rotated between chicken picatta and chicken parmesan. Always. Even as a kid I loved vinegary things like capers and tangy things like lemon and my love of the two has only grown over the years. Traditionally, you are meant to butterfly the chicken breasts, which is fine and all if you want to go to the effort and dealing with sharp knives. I tend to cause myself great bodily harm when attempting to do something like that, so I like to pound the chicken with the flat side of a meat tenderizer. It also doubles as a great stress reliever. This is a recipe I’ve made a million times, so the measurements are more rough suggestions than strict rules. 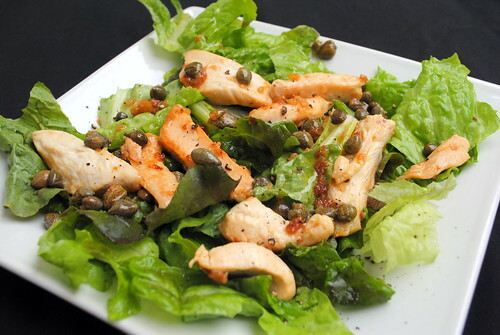 I like a lot of capers, garlic, and lemon, but if you don’t just adjust to your tastes. In a large skillet over medium high heat, melt butter with olive oil. When butter and oil start to sizzle, add chicken and cook for 3 minutes. When chicken is browned, flip and cook other side for 3 minutes. Remove pan from heat and add chicken to the plate. Into the pan add the lemon juice, wine and capers. Return to stove and bring to boil, scraping up brown bits from the pan for extra flavor (these are the best bits). Check for seasoning. Return all the chicken to the pan and simmer for 5 minutes. Remove chicken to platter. If pan is looking dry, add 1 tablespoon butter to sauce and whisk vigorously. Pour sauce over chicken and garnish with parsley. Posted on February 27, 2011 by Clare Cooks! 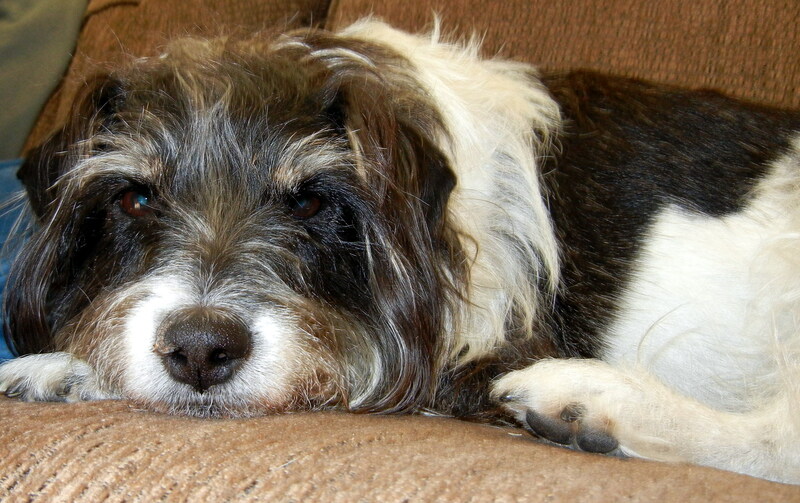 We are having a very lazy morning, well afternoon now, today. I haven’t slept well the past 2 nights, so I woke up late and made a brunch bagel. Smoked salmon, cream cheese, caper, red onion all on an everything bagel thing and (the biggest mug I could find of) coffee. Delish. I got the Salmon on my Costco run yesterday. 15 bucks for a pound of wild Alaska smoked salmon, definitely a win! After our walk I have an exciting day of dog baths, coupon cutting and hopefully some baking!